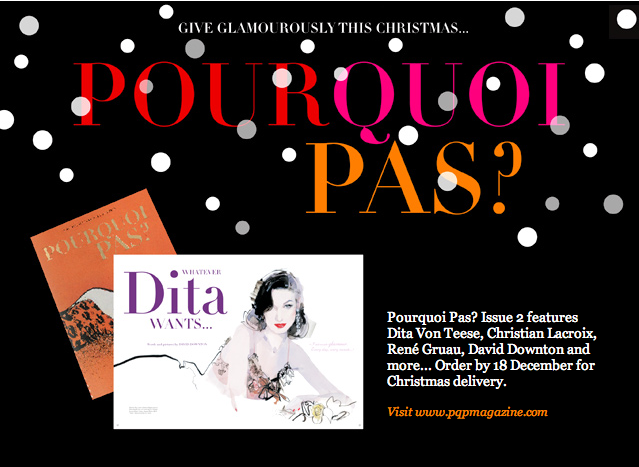 Fans of fashion illustration will want to snap up David Downton’s second issue of Pourquoi Pas? Magazine. With the exchange rate from British Pounds to American Dollars, it’s not exactly cheap, but when you get ahold of the 76 page, oversized magazine printed on heavy matte stock, it’ll be worth it. They’ve really done things right, and this issue features a Suzy Menkes profile of René Gruau. The magazine is printed in a limited run of 1500 copies and I think it’s a collector’s item waiting to happen. In London? Pop into Harrod’s or the V&A Museum for a copy. This entry was posted in Cultivating and tagged David Downton, Fashion illustration, Pourquoi Pas? Magazine. Bookmark the permalink. I can’t find this in NYC?! Believe it or not Tintin… 1,5oo copies only.